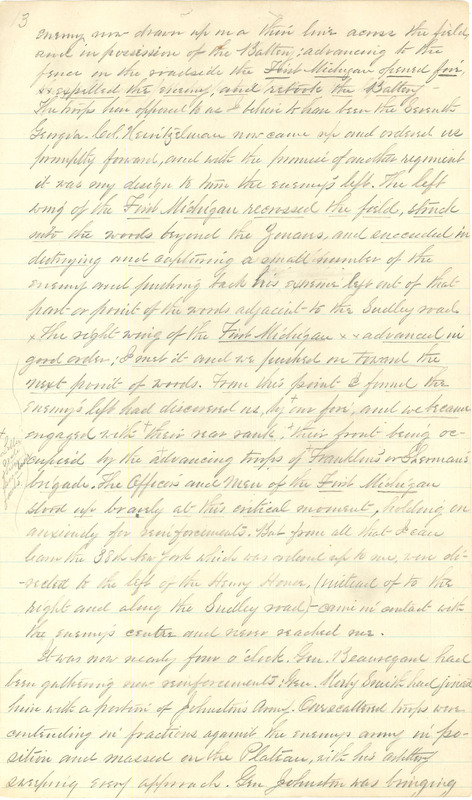 DIY History | Transcribe | Civil War Diaries and Letters | Account of the Battle of Bull Run, 1861 | 1861-Battle of Bull Run-Page 25. 1861-Battle of Bull Run-Page 25. 13 enemy now drawn up in a thin line across the field, and in possession of the Battery; advancing to the fence in the roadside the First Michigan opened fire, expelled the enemy, and retook the Battery The troops here opposed to us I believe to have been the Seventh Georgia. Col. Heintzelman now came up and ordered us promptly forward, and with the promise of another regiment it was my design to turn the enemy's left. The left wing of the First Michigan recrossed the field, struck into the woods beyond the Zouaves, and succeeded in destroying and capturing a small number of the enemy and pushing back his extreme left out of that part or point of the woods adjacent to the Sudley road. The right wing of the First Michigan x x advanced in good order; I met it and we pushed on toward the next point of woods. From this point I found the enemy's left had discovered us, by + our fire; and we became engaged with + their near rank, + their front being occupied by the + advancing troops of + Franklin's or Sherman's brigade. The Officers and men of the First Michigan stood up bravely at this critical moment, holding on anxiously for reinforcements. But from all that I can learn the 38th New York which was ordered up to me, were directed to the left of the Henry Home, (instead of the right and along the Sudley road) - came in contact with the enemy's centre and never reached me. It was now nearly four o'clock. Gen. Beauregard had been gathering new reinforcements: Gen. Kirby Smith had joined him with a portion of Johnston's Army. Our scattered troops were contending in fractions against the enemys army in position and massed on the Plateau, with his artillery sweeping every approach. Gen Johnston was bringing [Note at left-hand side:] + Letter notes [troops encounter fronts? ].